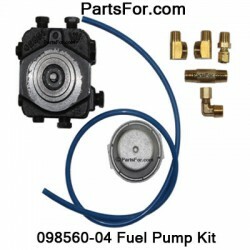 098560-04 HP FUEL PUMP KIT includes: 1725 RPM single stage pump, external fuel filter, tube and fittings. This kit fits certain Desa 350 and 600 kerosene heaters. The 098560-04 was used on Master, Reddy, Knipco, Koehring, LB White and Dayton brand heaters that were manufactured by Desa international prior to 2009. Click on the cross Ref. tab below for a list.